Setting the stage for Government of Andhra Pradesh’s ambitious initiative, #SpringConference 2017 was inaugurated at Novotel, Visakhapatnam recently. Fintech Valley Vizag is Government of Andhra Pradesh’s flagship initiative that brings together industry, academia and investors to innovate, co-create and build the fintech ecosystem. The Fintech Spring Conference 2017 marks the beginning of this journey. The primary objective of the event is to explore trends and opportunities in fintech. This is a platform where the finest minds of financial and startup community get to share mind-space with thought leaders, business leaders, artists, actors, musicians, futurists and entrepreneurs. In his keynote address, Special Chief Secretary and IT Advisor to the AP Chief Minister, J. A. Chowdary stated, “Indian IT 1.0 is facing difficulties. The next flight towards IT 2.0 will be backed by fintech. The tectonic shifts this will cause and entail is captured by the expression ‘fintectonics’. It is a fintech culture we are creating here – a culture of doing something for the betterment of the common man, a culture of creating an ecosystem by getting the right industry linkages and finding the right formula for the critical manpower.” Present on the dais were Mr. Roy Teo, Director, Fintech & Innovation Group, Monetary Authority of Singapore (MAS); Utkarsh Palnitkar, Partner KPMG; George Inasu – COO, Fidelity Financial Services; Puneet Pushkarna, Chairman, TIE – Singapore and Joe Seunghyun Cho – Co-founder and Chairman, Marvelstone Group . To accelerate the evolution of Fintech Valley, the Government of Andhra Pradesh (GoAP) has also initiated a fintech networking event every month, in addition to the annual fintech international flagship event. This year, on October 9-10, the government will host the Blockchain Technology International Event. The flagship Global Fintech Summit will take place on Feb 19th & 20th, 2018. This event provides the opportunity to participate in the $1 million global fintech award challenge and the INR 1 crore Indian fintech award challenge. An invigorating Investment Panel Discussion on ‘Funding Fintech – wearing an investor’s hat’ was moderated by P. S. Sreekanth, Investment Director, Hyderabad Angels; Sampath Iyengar, Partner, Forum Synergies; Abhinav Chaturvedi, Principal, Accel Partners; Prasad Vanga, Founder and CEO, Anthill Ventures; Utkarsh Sinha, Enterprise Technology Investor, Bitkemy Ventures; Puneet Pushkarna, Chairman, TiE – Singapore and Utkarsh Palnitkar, Partner and National Head IGS Advisory Management, KPMG. Beginning the discussion with the post demonetization scenario, the panelists sustained their dynamic dialogue in identifying fintech investment portfolios with high RoIs. Additionally, the finalists’ demos and presentations for the ICICI Bank Start-Up Challenge & the HDFC Life Start-Up Challenge were showcased to the audience, wherein the competitors took questions from the judging panelists. Following this, another Banking Panel Discussion on ‘Consumers and Marketplaces changing in an increasingly cashless world’ was moderated by Ms. Neha Punater, Partner and Head Fintech, KPMG. Key panelists Akhil Handa, Advisor to MD&CEO, Bank of Baroda; Shashi Bhushan, Managing Director, Investment Management Technology, Goldman Sachs India; Ramesh Loganathan, Professor, IIIT Hyderabad and Sudin Baraokar, Head of Innovation SBI discussed challenges faced by start-ups in being unable to identify and direct resources towards the accurate fintech problem area. They also proposed the need to create a consolidated industry-wide ‘use case’ library to facilitate innovation. Furthering collaboration towards developing this ecosystem, the Government also signed a partnership agreement with Lattice80, Pearson, Anthill Ventures, HackerEarth, F6S, Forum Synergies, Hyderabad Angels, Zone Startups, ParadigmIT and Trade Land Finance Tech Consortium (TLF). 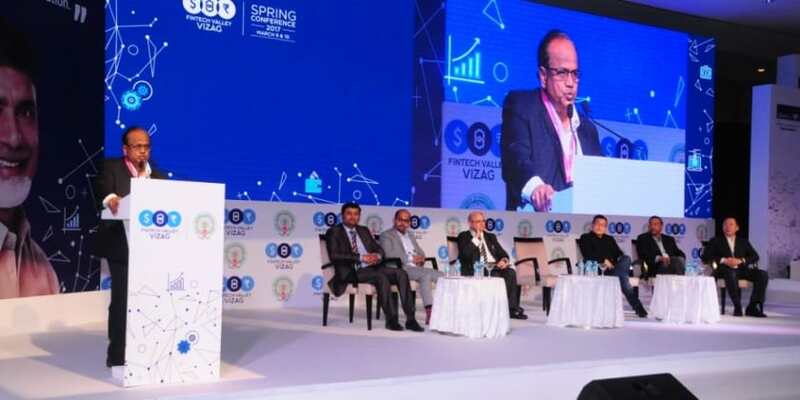 The first Fintech Valley Vizag Spring Conference brought together fintech companies, start-ups, researchers and key government officials working in the fintech sector and provided opportunities for disruptive business solutions. The peaceful atmosphere offered by Visakhapatnam compared to other bustling tech-hubs in India, created a serene environment for igniting fintech innovation and disruption ideas at the Fintech Valley Spring Conference. Fintech Valley Vizag is rapidly becoming the epicentre of fintech disruption. Since the launch of Fintech Tower, the Andhra Pradesh government has signed numerous partnership agreements with renowned educational institutions, corporations and governments that share the state’s vision of becoming pioneers for building strong standards for fintech and mutually sharing the desire in working towards cooperative advancement through information and resource sharing. Global participation marks Spring Conference 2017 at Fintech Valley Vizag 0 out of 5 based on 0 ratings. 0 user reviews.